Canadian pianist, Diana Dumlavwalla is an Assistant Professor of Piano Pedagogy at Florida State University. 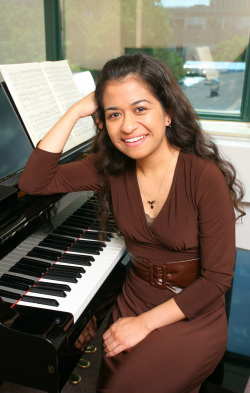 Previously, Diana taught at Western University where she developed the faculty’s inaugural doctoral piano pedagogy course. Additionally, she was an instructor at the University of Toronto, University of Windsor, Wilfrid Laurier University, the Beckett School in Kitchener and was also the director of the Children’s Piano Pedagogy Program at the University of Toronto. She also serves as a member of the Royal Conservatory of Music’s College of Examiners and adjudicates at local, regional and provincial festivals. She is an active member of MTNA, ORMTA, and the Association of Canadian Women Composers. As a soloist and chamber musician, Diana has performed in North America, Europe and Australia. Her performing interests also extend to new music. She has presented lecture recitals and papers at the World Piano Pedagogy Conference (Phoenix), National Conference on Keyboard Pedagogy (Chicago), John Weinzweig Symposium (Toronto), Australasian Piano Pedagogy Conference (Queensland) and the London International Piano Symposium (U.K.). Diana completed the Doctor of Musical Arts Performance degree at the University of Toronto studying piano with James Parker and piano pedagogy with Midori Koga. She received her Master of Music (Piano Performance) at the Royal College of Music in London, Honours Bachelor of Music (Piano Performance and Voice) at Wilfrid Laurier University and an Associate diploma from the Royal Conservatory. She has studied with many other fine pedagogues including Agnes Olsheski, Virginia Blaha, Heather Taves, Yonty Solomon and Logan Skelton.